Our Product Spinners will gently spin your product 90 or 180 degrees in either clockwise or counter clockwise direction with ease. We offer several different types of Product Spinners to provide our customers with the perfect solutions to their diverse types of products. 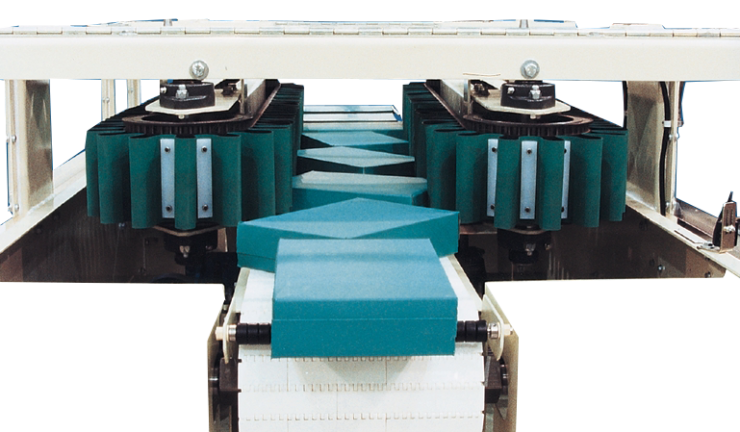 Our Standard High Speed Product Spinner uses two soft belts to gently reorient your product while it is moving on a conveyor of your choice. In many instances it can be retrofit to your existing conveyor. We also manufacture other smaller spinners such as Bump Turn Spinners, Finned Belt Spinners, Powered Wheel Spinners, Air/Spring Arm Spinners, and AIR DECK® Spinners.